Villain Couples. My take on the villains and who they would match up to!. HD Wallpaper and background images in the ডিজনির ভিলেন club tagged: disney villain villains ursula sleeping beauty maleficent. My take on the villains and who they would match up to! This ডিজনির ভিলেন fan art might contain নকল মানুষের, কমিক বই, কমিকস, and কার্টুন. You should've put Sykes and Mother Gothel in this picture. 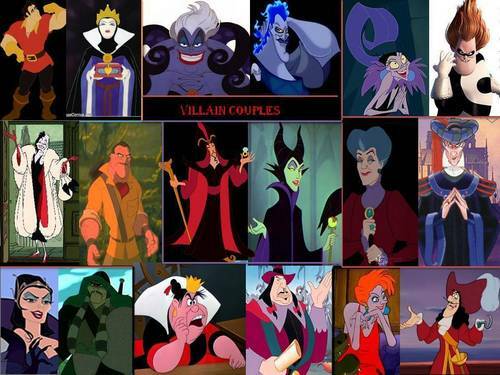 They're good villains. ডিজনি Villains - "Playing With the Big Boys Now"
ডিজনি Villains - "Cell Block Tango"